I have been avoiding shops for a month or so now, as I am on a spending ban. I've had a voucher burning a hole in my pocket though, one of those high street ones you can use in lots of different stores. Finally, I broke. I had a day to myself with nothing planned - so I headed to my local Peacocks yesterday, determined to spend my voucher on something I need, such as a sleeveless work-appropriate top for the heat, or a work-appropriate summer dress. Their sale is really good, I have to say! I saw lots and lots of things that I liked, including a fab selection of scarves from the Spring that I never bought, but are now reduced to £3 or so. 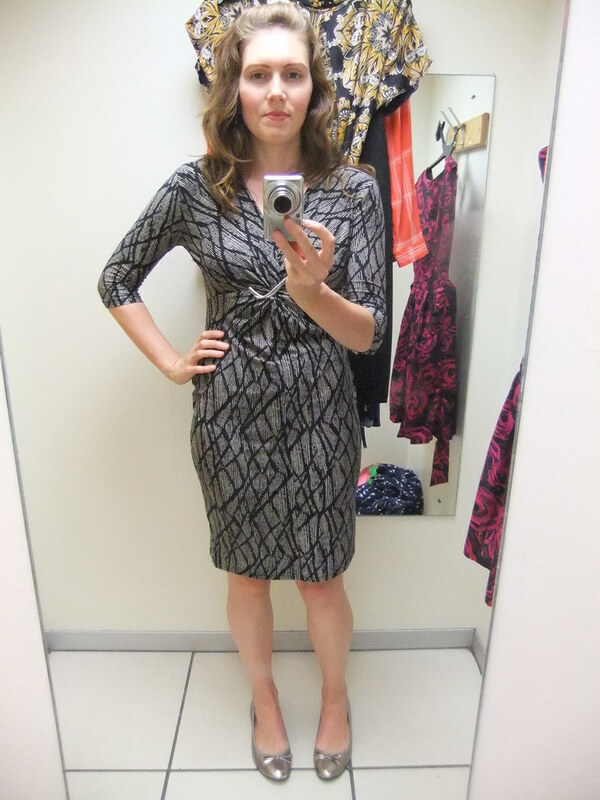 I headed to the changing room with an armful of dresses - all on sale between £8-£12. Here's how I got on. Trying on the first dress resulted in a predicament. The zip got stuck halfway up. I had to pop out of the changing room and ask a member of staff if she could release me, which she couldn't, so then I had two members of staff trying to get me out. The zip would go up but not down! I took some deep breaths and tried not to panic, joking to them that I'd have to wear it home. I started to feel a bit hot and light headed, but just as I thought I'd have to ask them to just "RIP IT OPEN!! LET ME OUT!!! ", the zip was deftly unstuck and I was released. The sales assistant helpfully said that she thought the thin fabric was getting sucked into the zip, as she had a dress that behaved similarly. It looked so fabulous on that I decided to risk it, despite the zip, which on close examination I felt could be fixed by a few stitches alongside it to keep the fabric taught and out of the way. I ended up paying for it with my own money though, as my voucher turned out not to be accepted in Peacocks after all!! So much for trying to be good. And so much for not buying any more party dresses, ahem... 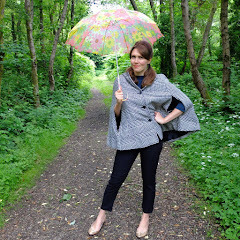 I think I could get away with it for work though, especially in winter with tights, a cardi etc. This next one wasn't on sale but I thought it might be good for work in the winter. It wasn't amazingly flattering, so I left it there. 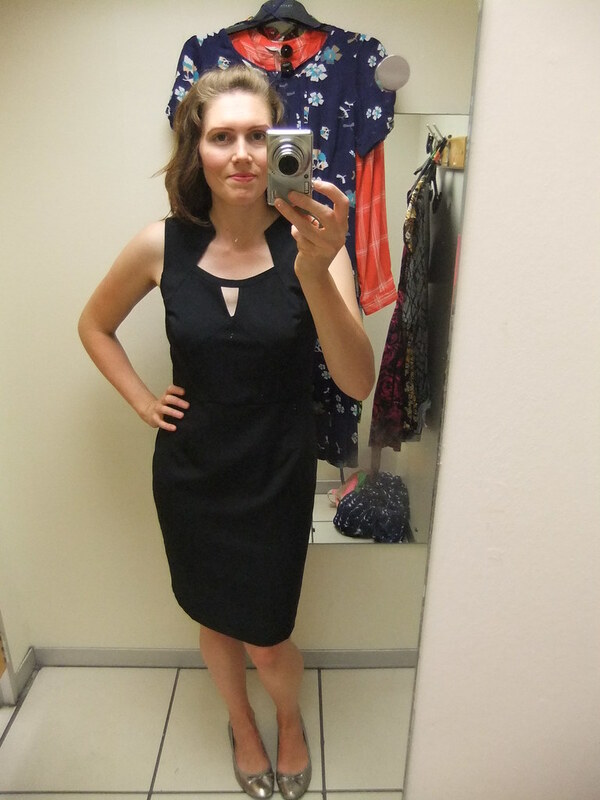 I then tried on a power-dressing black shift dress, again thinking of work, but there was some odd ruching on the bust that probably was only there because my bust wasn't big enough to fill it. 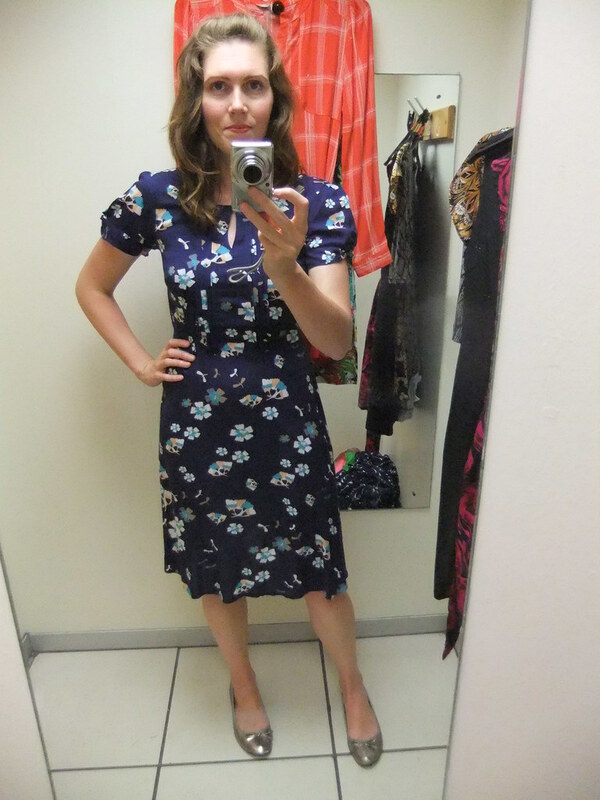 Next up, a floral tea dress, which I really liked, a nice navy blue that I thought would go well with lots - but it was a size 10 and too tight across the back and shoulders, it's not even zipped up in this picture. No size 12, so I missed out there. A red shirt dress was next, which I really did like. 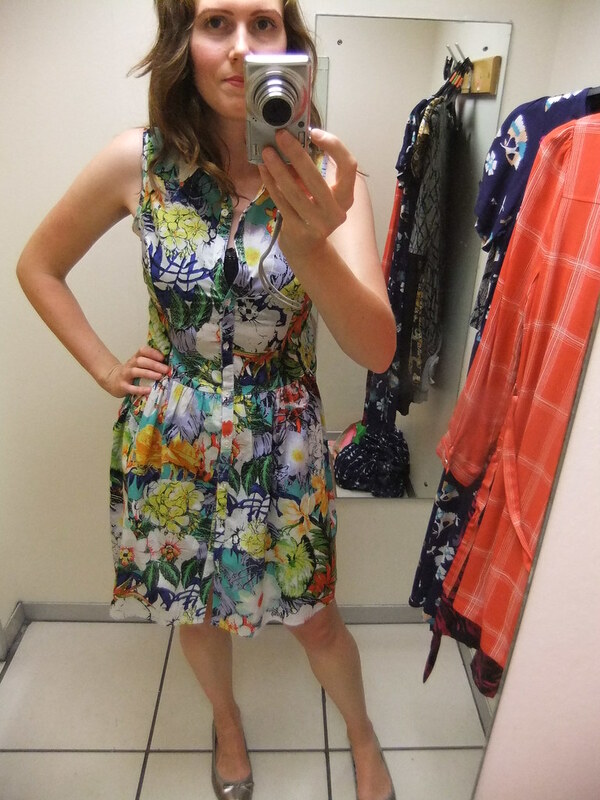 It was a size 10 again but much roomier than the floral tea dress. A tad tight on the hips maybe? I might try and track it down online in a 12, or go to another store. I could see me wearing that to work in the winter with tights (it's quite short), and bare-legged for socialising. Please excuse the wrong underwear. 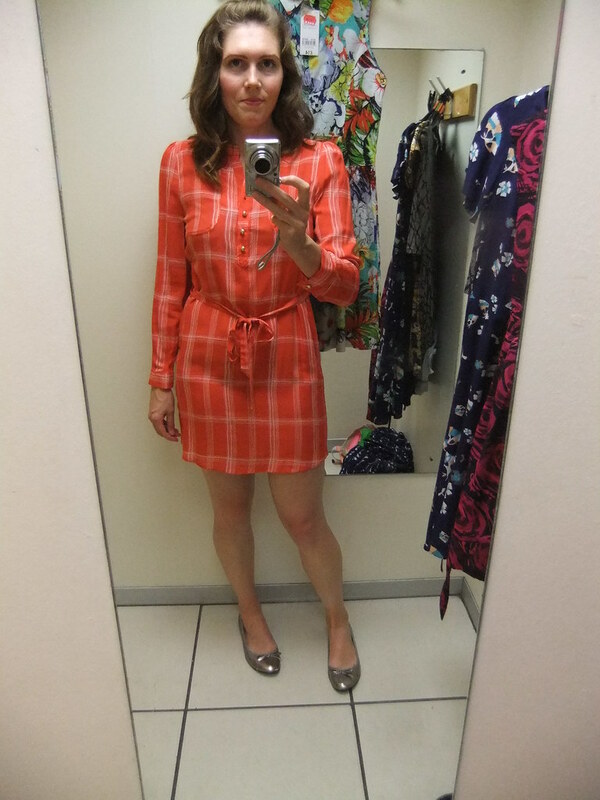 Finally, I really loved this fun cotton shirt dress, the fabric is lovely and light and the colours are amazing. Alas, again it was only in a size 10. I would snap this up in a 12. As it was, I couldn't do it up over my bust. Online has a really poor selection compared to what was in store - check out your local one. I tried Cardiff St David's store the other day and there was nothing left, but my local store was filled to the rafters! I'm glad you bought the first one despite the wonky zipper. It is gorgeous. I also liked the floral tea dress and the black shift, but if they don't fit properly it's a good thing you left them. 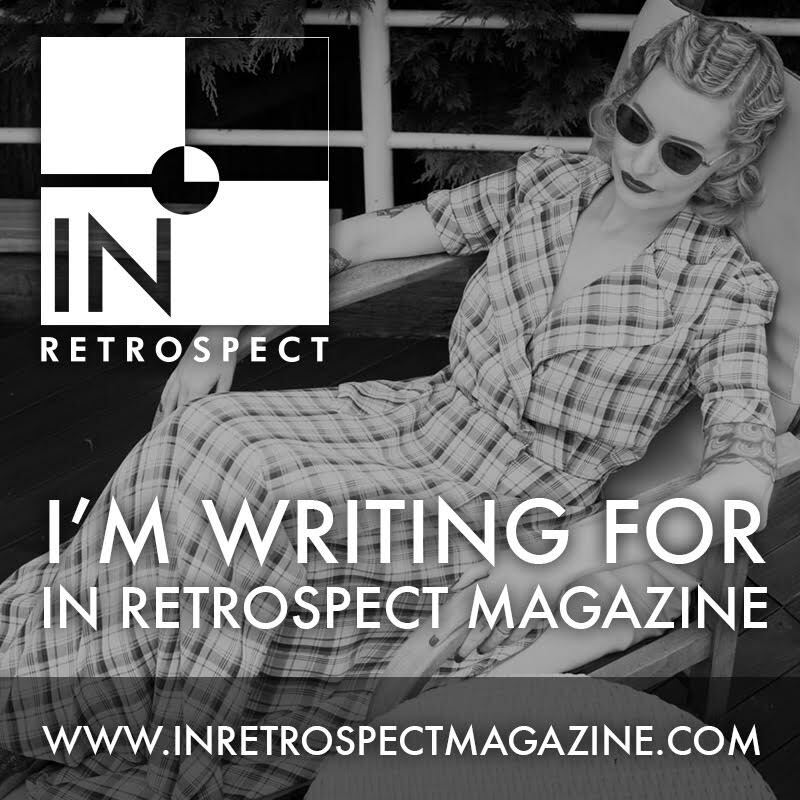 All wonderful retro inspired pieces though. That tea dress was so pretty, such a pity you couldn't grab it in your size. I love that vintage-y styles are so popular right now. I found a gorgeous dress at Zara - beautiful green tropical print, very full skirt - on sale for $35 (which I think works out to about £20). You look awesome in all of these dresses! I hate it when you find something you love but they don't have the right size. 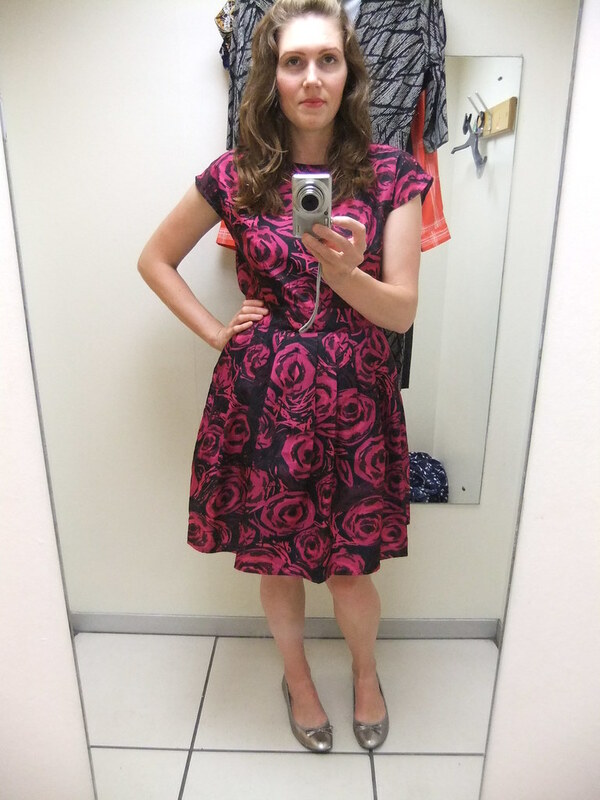 I really need to start taking photos in the dressing room to see how I like things on. It's such a great idea. I agree with the commented above me--it's a shame about that tea dress! That one is so cute! I do love the first dress, though, despite the zipper problems. So pretty! Such pretty dresses and you wear them so well. Thanks for sharing with Visible Monday! so many pretty dresses that look great on you, I would want all of them! The one that you got stuck in is my absolute fave, I have it in a different colourway and it is a gorgeous pretty dress. I love all dresses especially the first one with the gorgeous brocade rose print and the mini orange shirt-dress. I seriously wish I had them all. 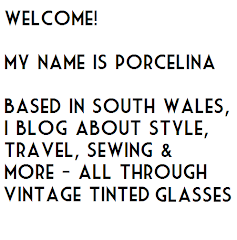 I am doing an all week of Dresses on the blog this week, Porcelina. I know you love Dresses so please stop by and let me know what you think. Thanks so much. <3 Ada. Very cute picks! The first one is my favorite though. I loved your commentary as well! Although this post does make me want to go shopping and I'm trying to be good! I really think they all look wonderful on you. Love the LBD looks like a great fit and great all around dress to do so much with. Love the color and print of the first dress. All looks so lovely!! The first and last dresses are my faves!! I wish we had a Peacocks in the US. Looks like they have some adorable pieces!! I LOVE the pink rose dress and shift dress. You look amazing in both. So many great options, but my favorite is the first one!! So impressive! Love your finds so much, and how elegant you look in them. We have nothing like these pieces showing up at our thrift shops in our area ... the thrift finds are only as good as what the populace purchases in the first place, and here, it's mostly fast fashion from Big Box stores to begin with. But it will get better, one day! i am loving peacocks again lately, they really have gotten their groove back. I've bought 3 or 4 items from their lately and happily shocked at how good the quality is.